A Slice of Smith Life: Today is Saint Lucy Feast Day! 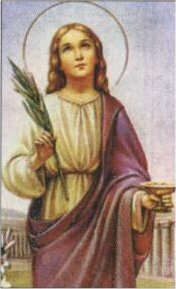 Today is Saint Lucy Feast Day! Lacy at Catholic Icing has a beautiful post with ideas and resources to celebrate St. Lucy's feast day so be sure to check out her wonderful blog. Happy Feast of St. Lucy! I will have to head over to Catholic Icing to check out Lacy's ideas. My kids are SO excited to look at Christmas lights tonight, too. A great tradition to start :) Sorry about the van. We went through this just last week when a costly EPA filter went out and our emissions inspection in TX is due in two weeks. Terrible timing! How fun to read about St Lucy's Feast. I love what your oldest daughter gets to do to celebrate this Saint. Thanks for the links too! Blessing to you and enjoy the moments of this Christmas Seasn. Enjoy the lights - sounds like a wonderful outing - we need to "formalize" ours a bit more than just what we happen to see as we're driving around. Merry Christmas - I'm new to NOBH and your newest follower. What are the 12 Days of Christmas? He's on His Way ! Celebrating St. Nicholas' Feast Day!